Double Standards of Indian press. Indian leading newspaper Times of India which is in forefront for virtually running ‘save Sarabjit Singh’ campaign (an Indian spy), is religiously following every news regarding to him and every word of his family is given much more attention to make his release a ‘national issue’, as if whole of India is dying to see it’s ‘proud son’ setting his foot on Indian soil. Recently Home Minister Shivraj Patil while speaking to media persons in his native place Latur in Maharashtra, said “people are saying don’t hang an Indian in Pakistan, Sarbjit, and then are demanding hanging of a Pakistani, Afzal Guroo (who is a Kashmiri, may be mistakenly said as Pakistani by Patil) this is not fair. As it seems from this statement some sort of better sense has prevailed upon a section of Indian people although in minority. As is usual with Indian press, which is totally biased and throws journalistic norms to winds in case of reporting about Kashmir this news paper mentioned above reported that “by equating the case of Guru, held guilty and sentenced to death by supreme court for the 13/12 attack in 2001, with that of Sarbjit, in whose case the Manmohan Singh government has not endorsed the conviction for terror charges, patil seems to have stepped onto a mine field. Not only does his comparison imply that Sarbjit is “guilty” of a terrorist act, it will also be read as a defence of Guru”. Afzal Guru, who is pleading to be innocent and denied fair trial, is accused to be conspirator and as such can’t be handed death sentence according to Indian constitution, still no one from Indian print or electronic media has uttered a single word in favour of him. Indian media today is in whirlpool of duplicity and double standards and if someone shows consciousness to stand by truth he is shown the exit door as was done to senior journalist M.J.Akbar, founder editor of Asian Age. The criticism of patil’s statement by BJP and other radical extremist parties in India is understandable. 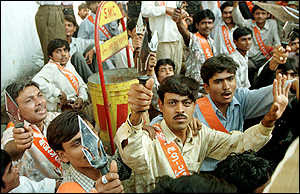 By spreading hatred against Muslims and Pakistan these onetime fringe elements able to win only few seats was able to form their government at centre with overwhelming majority, that is total opposite in Pakistan where it is generally believed that people support extremist radical groups and hawks rule the roost there, no religious or ‘extremist’ party has been able to form government since it’s birth. Very recently L.K.Advani praised Ali Muhammad Jinnah in Pakistan and back home he had to face uproar and forced to eat humble pie by stepping down as BJP President. Intolerance is growing fast in India which is supposedly ‘world’s largest democracy’ one can only hope that better sense prevails upon rest of majority in India. This refers to the statement of J.I chief that “elections have no effect on the future status of Kashmir.” This is a positive sign and good change of thinking. Elections in no way can be proved as substitute to plebiscite nor do the so called elected representatives have any legal authority to change the status of J & K. It has been laid down in 1957 UN Security Council resolution that the “Administration of Jammu and Kashmir can not take any decision which may change the status of territory of Jammu and Kashmir.” Its powers are restricted only up to developmental works and has no power more than that of Municipal Corporation. The anti election campaign by pro-freedom leadership calling for boycotting elections as only way to remember mission and martyrs gets boomeranged effect as it is virtual approval of Indian view point that this vote is not only for choosing candidate but for her also. Despite overwhelming boycott by people India still manages to show long queues of people waiting for their turn to cast vote through its biased print and electronic media and sells this to outside world by its strong propaganda mill. Pro-freedom leadership should evolve new methodology and strategy rather than usual calls of boycott, which people will even without their appeal as happened in October 2002 assembly elections when hurriyat was accused of running passive anti election campaign still 79% of people boycotted elections, they should make people and world aware of the fact that elections cannot be alternative to right of self determination as JK assembly can’t decide their future and even Indian parliament can’t take decisions on our behalf as stated by Pandit Nehru in Indian parliament. And even if they pass resolutions declaring J&K ‘integral part’ of India 100 times it has still garbage value and hence cannot be construed as vote for India. Kashmiri leaders should woke up from deep slumber and give this movement new vigour and impetus and should take cue from independence of South Ossetia from Georgia last year and of Kosovo from Serbia 17th of feb this year. Opinion Poll of CNN-IBN and Dawn. Let us Be Proud Kashmiris. Entire Kashmir has been under siege and on other side not a single day passes when we don’t hear the news that Kashmiri truck drivers have been attacked by unruly mobs on highway and government is busy feeding us lies that hundreds of trucks have went and left Kashmir. The economic blockade of Kashmir by fanatic groups of Jammu, if seen in wider perspective is not result of cancellation of land transfer to SASB but this seems a well knotted conspiracy by higher ups in Delhi to spread regional hatred to pay way for separation of 2.5 districts of Jammu. The thinking behind this is to permanently settle sharnathees who came here after the partition of India from various parts of Pakistan and block the return of lakhs of muslims of Jammu region who were made to fled in 1947 and occupy their property which is declared as evacuees property. In Jammu about 5 lakh muslims were massacred and mainly on 4, 5 and 6th November 1947 and more than 5 lakh were pushed across leaving their property behind. According to Malthusian law, population gets doubled after every 25 years and according to it these muslims would be more than 20 lakh till now. There is fear among fanatic groups that if they returned tomorrow to their native land the composition of Jammu will revert to its real form and they won’t be even able to take away these 2.5 districts of Jammu region. The call of coordination committee that people should raise slogan of “Hum kya chaetai haqe khud iradiyat” though based on facts but it seems that leadership is fallen short of ideas. ‘Hum kya chaetai Azadi’ or we want freedom naturally reverberates from the core of heart and it is this slogan which we want to make it hear loud and clear to the world. Instead of inventing new methods of protest leadership is taking away good things from movement. Still after this call protests at lal chowk by students and Para medics and at massive rally at eidgah only Azadi slogan rented the air. When the PDP launched so called peace march few years ago and appealed participants to say “Hum kya chaetai amanu aeshiti” only Azadi slogan reverberated and PDP had to eat humble pie. At this time when international community and media is taking interest and keeping track of developments here we have to be very cautious and careful and protect and prevent this revolution from going off the track. There is no need of identifying this mass movement with Pakistan. We have seen how revolution of early 90’s got lost due to this and we got nothing in return. More ever this won’t help us at international level and by this we are making this dispute between India and Pakistan only. It is understood that ultimately this dispute has to be solved through tripartite talks and on negotiation table neither India can take away whole Kashmir nor Pakistan can take it away. And Kashmiris won’t accept any solution reached only between these two which negates their aspirations. So best solution is that both countries cease claim on their respective parts of Kashmir and allow it to get united and emerge as an Independent nation. It is deplorable that Pakistan’s current strategy is that we keep giving sacrifices and it will be our blood that will get spilled on mountains, river-lets, forests, streets and in every nook and corner and in the end it will take it as gift. On other side of our Kashmir in govt functions they display banners written “Kashmir will become Pakistan”. If they are really practical about this we will write this slogan with our blood we have no problem with this, but for that there in only one option that is all over war with India. Is Pakistan ready for that? What preparations our “base camp Azad Kashmir” has made for this? Where are their tanks and fighter planes? They were having their own army, there was no need of merging it with Pakistan army and increase burden on them. Our so called Mujahide Awal thinks it is not Jihad it is ‘fassad’ here and back home sings old song of Jugular vein. So stop blackmailing us in the name of “base camp” and don’t fool and emotionalize our youth for what is not practable and viable. 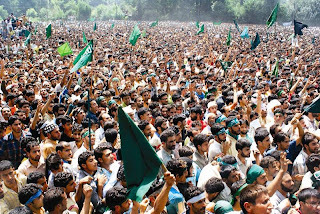 Some quarters argue that demanding Independent Kashmir amounts to Nationalism which is against Islam. Nationalism is against Islam and it means subjugating other nations, robbing its resources and blind following of ones own nation. Kashmir was Independent nation and its history is 5000 years old it lost its independence at the hands of Mughals on 1585 A.D and since then only oppressors have been changing. India and Pakistan are exploiting our natural resources (especially water resources) to the benefit of their own and raising dams on our soil using our resources for electricity and other purposes and leaving us in lurch. Aren’t they actually following nationalism? It is our right to fight against occupying forces for the independence of our motherland and that is Patriotism, a good deed in Islam. Even Shahi-Hamdan (A.R) endorsed our independence. Further more the great warriors of Chechnya; Palestine, Iraq and Afghanistan are also committing “sin” of demanding independence of their motherland. The total area of Jammu Kashmir is about 84000 sq miles which is more than individual 93 independent countries and has population more than that of 125 independent countries of the world. We have so much of economic potential if used in better way we will be even able to give aid to other countries. Kashmir has tremendous water resource by which we will be able to generate hydro-electricity on large scale which can be exported to our neighbouring countries, alone through this we can become rich state. Kashmir is world famous tourist spot with fascinating and breathtaking natural beauty which can attract thousands of elite tourists who can spend thousands and lakhs and we will be able to earn billions of foreign exchange. Natural herbs are found in abundance in Kashmir and we can use them to make hundreds of medicines and it can prove big source of income. There is tons of waste wood in the forests of Kashmir which is not used and their quantity is increasing, this can be tapped and taken out to make paper for printing and for other uses we can setup hundreds of paper factories here. Fruit, timber, minerals and handicrafts of Kashmir are famous all over the world and can prove big asset for our economy. There are thousands of doctors, engineers and other professionals on both sides of C.F.L working in different countries and earning tens of billions in foreign exchange. Within short period of time we will be great economic powerful country than rest of our neighbours. People of Kashmir have shown in different international polls that overwhelming majority is with Independent Kashmir. And to the satisfaction of India and Pakistan we say let kashmiris decide themselves their fate whether they want to remain Independent or accede to India or with Pakistan. It can act as buffer state between India and Pakistan only if better sense prevails over both countries. The government decision of allotting 800 kanals of forest land to SASB has totally backfired. There seemed a nefarious motive in allotting land to this board. As yatra was going on from more than 100 years and till it was under the control of kp’s and people of Kashmir it was running smoothly. This board, which is totally alien, it consists only two kp’s and governor who is from outside is its head and his secretary who hails from outside runs affairs of board. The local mahants were performing religious obligations from centuries during yatra, when they opposed the construction of road and extension of yatra period because the shivlingam remains not for more than one month and creating artificial shivlingam and increasing its period by refrigeration is tantamount to play with spiritual and religious sentiments of Hindus as it goes against their scriptures, they were elbowed out which smells something fishy and shows their malafide intentions. Therefore people of Kashmir were totally right in demanding revocation of this land transfer. Besides this Kashmiris want kp’s to take control of yatra. Kashmiris don’t need lessons from anyone on communal harmony as they have maintained it in most trying and tough conditions. The Jammu agitation which is headed by saffron brigade and tacitly supported by congress, establishment and other pseudo secularists and pseudo intellectuals have exposed themselves. In this regard criticism of Balraj Puri by Firdous Syed (G.K. columnist) is totally fair and justified. When the communal bigots and chauvinists in Jammu were lynching, brutalising and battering Muslims, destroying their properties, attacking their religious places, serving them ultimatum of quitting Jammu or be ready to face dire consequences and strangling life-line of Kashmir it is strange that Mr.Puri instead of playing his role in helping to safeguard life and property of muslims and ending blockade was giving sermons to muslims of poonch and rajouri, who were facing wrath, mayhem and carnage at the hands of agitators, to help the conducting of yatra of Booda Amarnath and maintaining communal harmony. It would have been better had he served these sermons to the barbaric and ruffianistic agitating hooligans. Mr.Puri tries to justify himself and cover the misdeeds of saffron brigade by saying that it was after his efforts that state unit of BJP condemned any attack on Muslims. But has this condemnation made any difference in their attitude? Economic blockade is still going on, as truck drivers fear for their life to ply trucks on highway as they were and are being attacked by mobs with petrol bombs. Many drivers were burned and they aren’t believing that they are alive. Astonishingly Mr.Puri behaves as spokesperson of govt and army declaring on their behalf that blockade ha failed. By snapping Kashmir’s traditional and historic links our state has been deliberately made dependent on outside. Otherwise we have tremendous economic potential. Electricity generated in our state is supplied to outside and we are left with meagre royalties. How can industries flourish here without electricity? 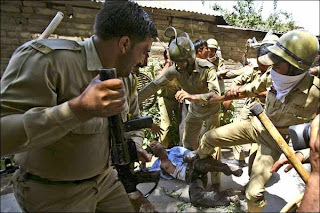 On every front Kashmir is facing discrimination. We must appreciate Reshmi Segal when she says that if Indians want to boycott Kashmiri products they must boycott electricity generated from Kashmir as well. 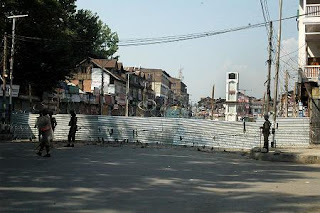 Mr.Puri blockade is not act of few it is well planned conspiracy hatched by higher echelons of power and different intelligence agencies and implemented by those spearheading agitation in Jammu. 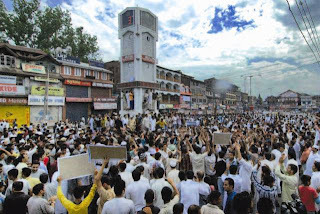 Sangarsh samiti had publicly declared its plan of blockade of Kashmir and is well evident from RSS mouth piece in which it is mentioned that “As Hindus refused to take it lying down, causalities are increasing even as Jammu-Pathankot highway is blocked to make the protests punitive for Srinagar fruit sellers”. During Indian struggle of independence massacre of jallen-walla bagh took place, but here right from 1947 countless massacres have took place in which thousands of innocent people lost their life. How many Indian leaders were targetly killed by British troops? In contrast to what India is doing here British troops followed some sort of decency. Here number of eminent personalities, leaders and activists were assassinated and brutally tortured to death. 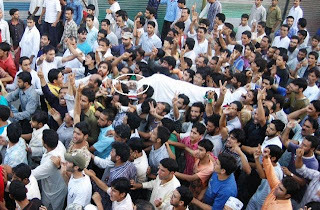 The martyrdom of Sheikh Aziz and other Kashmiris has infused new vigour and passion among people. The ruthlessness shown by forces and police on protestors in which 38 people were martyred in just 5 days has amply demonstrated on people of Kashmir that there lies no future for them with India. Regional pro-India parties who are collaborators of New Delhi in their every heinous crime have been rejected and subjected to disgrace even in Jammu. They were kept hostage at airport for hours and on sangarsh samiti protest were made to sit outside on Aug 9. They were already never accepted by people of Kashmir. Now only way for them is either to quit and kick away this election politics and join pro-freedom ranks with full sincerity which will be their salvation from the sins and crimes they committed on their own nation neither people will never forgive them. Narrow minded communal frenzy and followers of Indian Modi’ism have provided enough ammunition to our resistance movement for its survival and success.